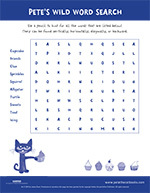 Download free Pete the Cat coloring pages and printable Pete the Cat activities. Learn the Cool Cat Boogie! 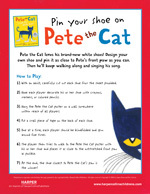 Follow the steps below to learn the Cool Cat Boogie with Pete the Cat! Host a totally groovy event with Pete the Cat and the Cool Cat Boogie! 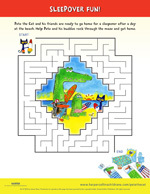 Help Pete the Cat find his way through the maze so he can boogie down with his friends! 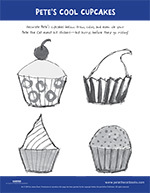 Decorate Pete’s cupcakes! 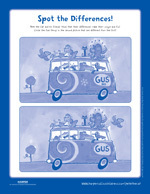 Draw, color, and even use your Pete the Cat event kit stickers—but hurry, before they go missing! 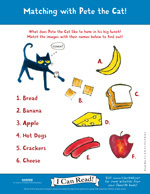 What does Pete the Cat like to have in his big lunch? Match the images with their names below to find out! Can you help Pete figure out what color his shoes are by unscrambling the letters below? How many groovy words can you make from the letters in PETE THE CAT? 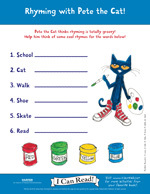 Pete the Cat thinks rhyming is totally groovy! Help him think of some cool rhymes for the words below! Pete the Cat loves riding the cool school bus! 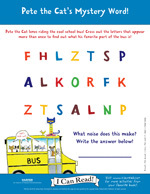 Cross out the letters that appear more than once to find out what his favorite part of the bus is! 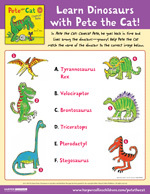 Help Pete the Cat match the name of the dinosaur to the correct image in this downloadable activity. 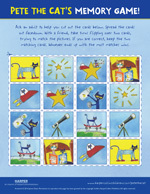 Take turns flipping over the cards with your friends and try to match the Pete the Cat pictures. 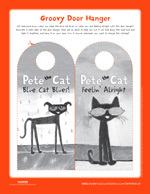 Let everyone know when you are snoozing or awake with this Pete the Cat door hanger! 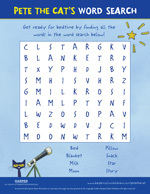 Get ready for bedtime with Pete the Cat by finding all the words in the word search below. Circle the things that a good friend would do and cross out the things that a good friend would not do. 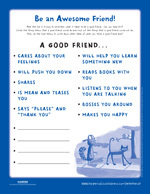 Then use the lines below to write down other ideas of what you think a good friend does! 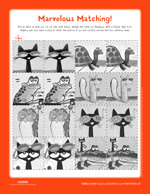 Pete the Cat and his friends think that their differences make them unique and fun. Circle the five things in the second picture that are different from the first. Pete the Cat is all about friendship! List a few of your friends below, and then write down something that each does really well. 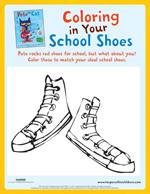 Pete the Cat rocks red shoes for school, but what about you? Color these to match your ideal school shoes. 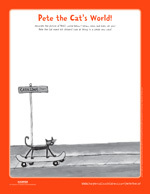 School is over, and Pete the Cat needs to get to the bus so he can go home. 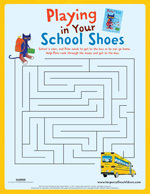 Help Pete rock through the maze and get to the bus. 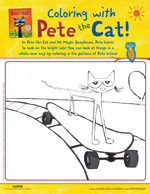 You can look at things in a whole new way by coloring in the picture of Pete the Cat! Celebrate Thanksgiving with Pete the Cat by making a cool turkey craft. 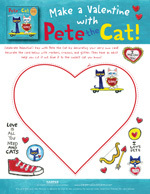 Celebrate Valentine’s Day with Pete the Cat by decorating your very own card! Pete the Cat loves his brand-new white shoes! Design your own shoe and pin it as close to Pete’s front paw as you can. Then he’ll keep walking along and singing his song. 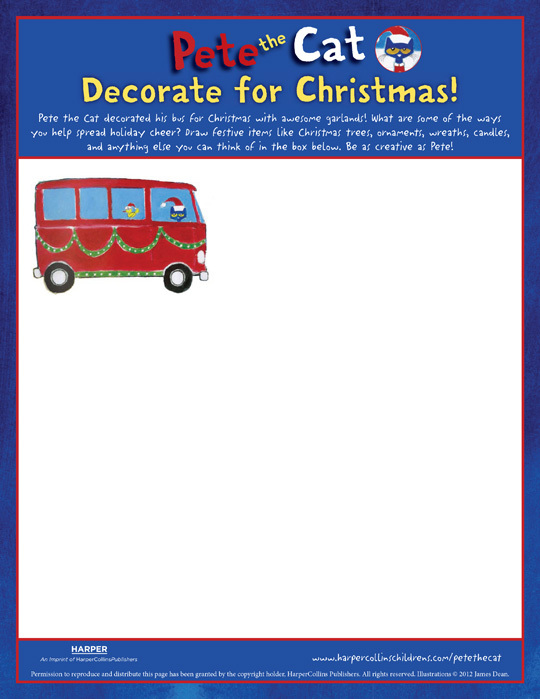 Decorate this Pete the Cat coloring sheet for Christmas! 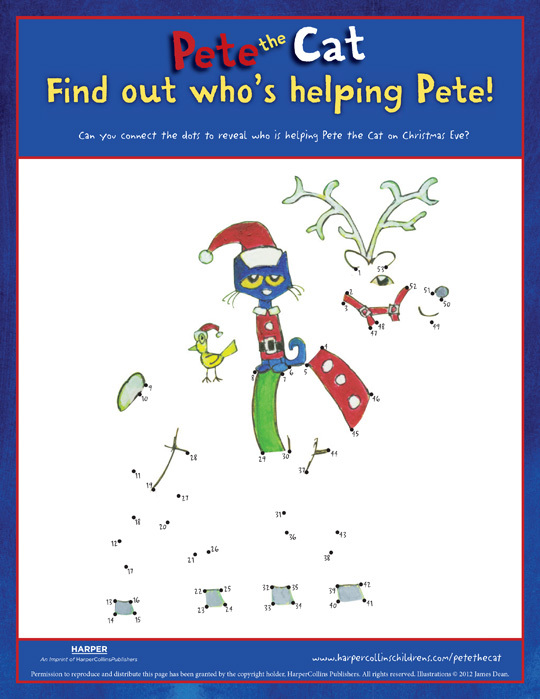 Can you connect the dots to reveal who is helping Pete the Cat on Christmas Eve? Santa isn’t feeling well and needs Pete the Cat to help deliver Christmas cheer. But first Pete has to get to the North Pole to pick up the presents! 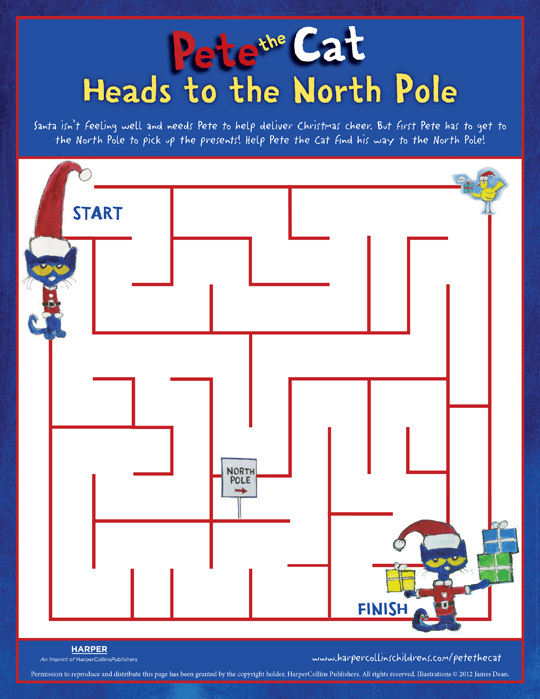 Help Pete the Cat find his way to the North Pole! Oh no! These elves dropped the bag, and all the presents have been mixed up! 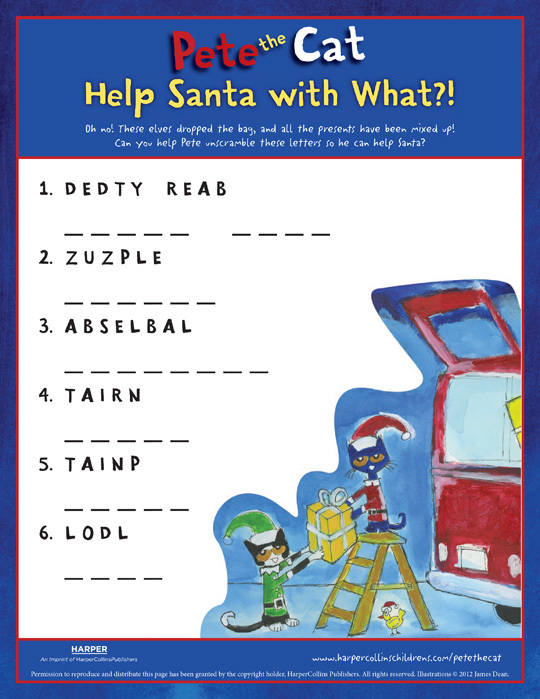 Can you help Pete the Cat unscramble these letters so he can help Santa? 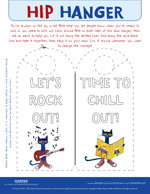 You’re always on the go, so let Pete the Cat help you let people know when you’re ready to rock or you need to chill out. Sometimes rocking out will scramble things up. 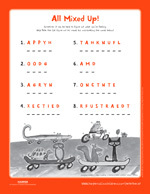 Help Pete the Cat unscramble the words in this activity. Pete is late for the bus! Help Pete get through the maze so he can catch the bus with all his friends. 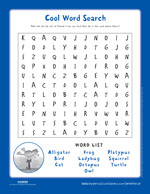 Use a pencil to hunt for the words that are listed in this printable Pete the Cat puzzle. 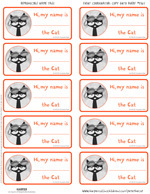 Match the images with this fun Pete the Cat memory game! Sometimes it can be hard to figure out what you’re feeling. 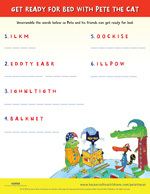 Help Pete the Cat figure out his moods by unscrambling the mixed up words! 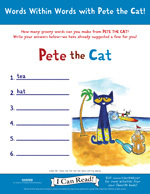 Look at things in a whole new way with this Pete the Cat drawing activity. 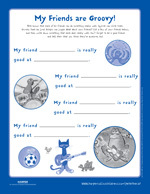 Play this groovy Pete the Cat memory game with one of your friends! 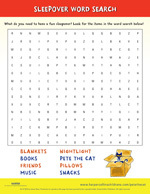 Buttons aren’t the only things that are going missing–help Pete the Cat fill in the missing letters of these words! 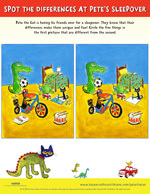 Can you spot the five differences between the two Pete the Cat pictures? 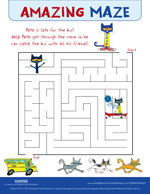 Help Pete the Cat through the maze to find his groovy button! 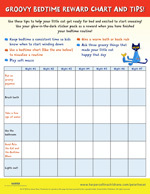 Use this chart and tips to help your little cat get ready for bed and excited to start snoozing! What do you need to have a fun sleepover? 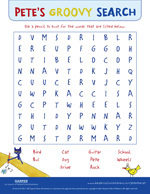 Look for the item names in this Pete the Cat word search! 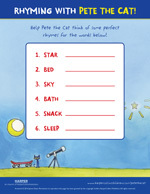 Unscramble the mixed up words so that Pete the Cat and his friends can get ready for bed. 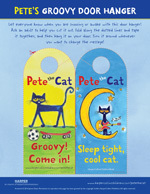 Have a groovy bedtime sleepover with these fun name tags!